Happy Monday! Today I'm using a background stamp called "Star Flower" from Rubbernecker Stamps, along with a sentiment stamp from the "Freehand Border Phrase Set". I used the Star Flower stamp with Versa Mark ink and clear embossing powder to heat emboss the stamp. The butterfly die cut is from CC Designs. I layered it together with some pink lacy ribbon from May Arts. I used a butterfly embossing folder from Stampin Up on the back mat. Today is another new release day by The East Wind, and the last for February. 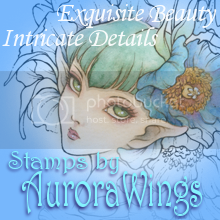 The new image is 'Aurora "Lady Rory"'. All of Unky's new releases this month were inspired by her South Korean roots. I used some vibrant colours for this card, but left the embellies to a minimum. I used an Asian inspired embossing folder from Cuttlebug for the mat on this card. I love the paper lanterns! I actually used it on the reverse side of the embossing. I think you can see the relief better (or maybe it's just my imagination). The floral die cut is from Stampin Up, as is the red and yellow paper (Regals colour collection). The very back mat is from the DCWV Asian mat stack that I have had FOREVER. I like to hide things like that in box, put them in my craft closet, and forget about them. Every once in a while I go on a treasure hunt to see what I can find that I've "lost". Hello! I'm bringing you a new release from The East Wind called "Gumiho - Nine Tailed Fox". I coloured the image with Copics. The paper and flower die cuts are all from Stampin' Up. I used E18-11 for the fox colours, and BG07-000 for her dress. The lace is from Maya Road. There are only a couple more days left to enter our "Love and Romance" challenge on the blog. I KNOW you made a Valentine's Day card for your significant other. 😉 Check the challenge rules out HERE. It's time for Team 1's Sweet Sunday post! 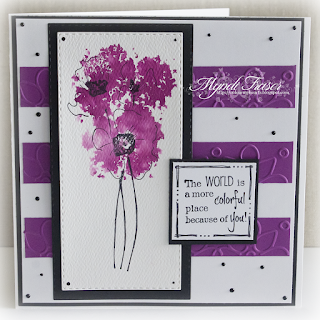 I used the watercolour stamp Poppy Field for today's card. I also used a sentiment stamp from the Freehand Border Phrase Set. I mixed the crimson and the blue from the Ken Oliver Color Burst Brights set with some water in a mister and made a dark purple. I sprayed the watercolor paper with water, then sprayed the stamp with my purple mist and stamped it on the damp paper. I held it down for about ten seconds to let the colour soak into the paper and then lifted the stamp. I was lucky to find some paper scraps that perfectly match the colour I created with the Color Bursts. I embossed them with a Cricut embossing folder. I added black dots with a Perlen Pen from Viva Decor randomly around the card to finish it off. I love that Perlen Pen. I think I need to buy a whole bunch more in a variety of colours. A new challenge was launched on the Rubbernecker Blog on Valentine's Day, so make sure you pop over there and check it out. There are two prizes of $25 and $15 up for grabs! Hello! 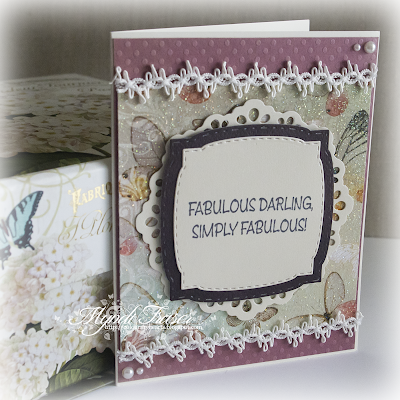 Today I have a card I made using Butterfly Inchies and Fluttering By from Rubbernecker Stamps. I made the background with the Inchies stamp and Ken Oliver Color Burst pigments. I sprayed a piece of watercolour paper with some water and then sprinkled the orange, yellow and crimson pigments from the Brights collection right on the wet paper. The colours took over and spread creating a colourful background. Because watercolour paper is not smooth, you can't see all the detail of the stamp, but when used on smooth stamping paper, it has nice, clean, detailed lines. It's a perfect stamp for creating a background. I used it on a previous card with Versamark ink and clear embossing powder. You can see that card here: http://colourmyhearts.blogspot.ca/2016/07/rubbernecker-stamps-showcase-butterflies.html . The butterflies are from a Martha Stewart punch, my other paper is from Stampin' Up. Please stop by the Rubbernecker blog for bi-weekly challenges. We have a new one starting on Tuesday, February 14. The prizes are a $25 gift certificate for 1st prize, and a $15 gift certificate for second prize. 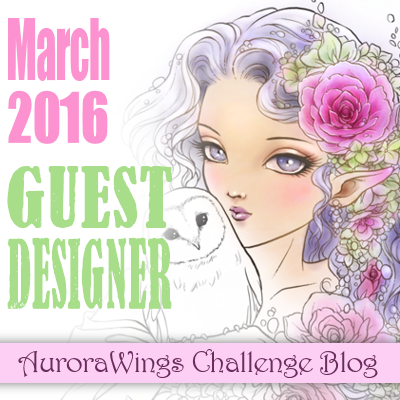 It is time for the first challenge of 2017 at Aurora Wings. Our challenge theme is a colour challenge in honor of Mardi Gras, so we want to see you use green, gold, and purple in your project. I have used Snapdragon Sprite for my card. I coloured the image with Copics, and used a variety of paper scraps from my stash. I also used two different gold ribbons, some paper flowers, a heart that I crocheted myself, and some filigree corners that I painted with Pebéo gold paint. 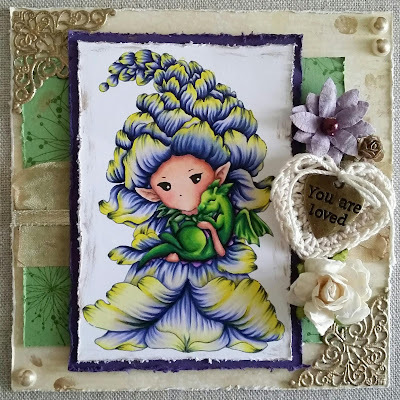 It is Team 1's Sweet Sunday post at Rubbernecker Stamps, and I made a simple little card you could use for a birthday or "just because". The sentiment is "Simply Fabulous". I had some scraps of some really pretty glitter butterfly paper from Kaisercraft in my stash. I used that along with some Bo Bunny dots paper in a pretty mauve colour. The ribbon is from May Arts. The super awesome people at Rubbernecker bought the DT a bunch of ribbon from them to make our cards with. Isn't that the coolest thing?! It is a really awesome team to be on. The Rubbernecker site has been overhauled and has a whole new look. 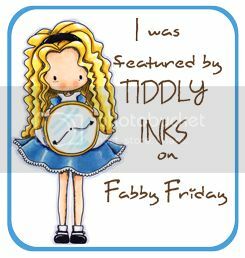 Make sure you check out some of their awesome new water colour stamps, and sign up for the newsletter so you're kept up to date with new releases and sales. For those of you looking for a challenge... Check out the current challenge and the rules on the Rubbernecker BLOG and enter your Love and Romance themed card for a chance to win. The first prize will be a $25 USD gift certificate to the Rubbernecker store. The second place prize is a $15 USD gift certificate. There will be an honorable mention 3rd place also. Today is a new challenge at The East Wind. We are doing a Love & Romance Challenge theme because it's Valentine's Day right around the corner. Show us your creations with a TEW image for a chance to win one of two prizes! The first prize for DT favourite is a colouring book by Unky and a $10 gift certificate to the TEW Etsy store. Second prize winner will be chosen by Random.org and is a $10 coupon and a postcard designed by Unky. I used the new Aurora "Be My Valentine" image for my card. It was just released last week and it is perfect for this challenge. It is also part of a four image bundle from January that you can get until February 5, after that day you will only be able to buy the images as singles. Hurry over to the store and snap it up while you can. As a special though, the image I've used is on sale for $2 for a limited time. I coloured the image with Copics and all of my paper is from Stampin' Up, along with the die cuts and the "Be Mine" sentiment and banner stamps. Please join us for the challenge and make sure you are signed up for the newsletter to get your free image every month. 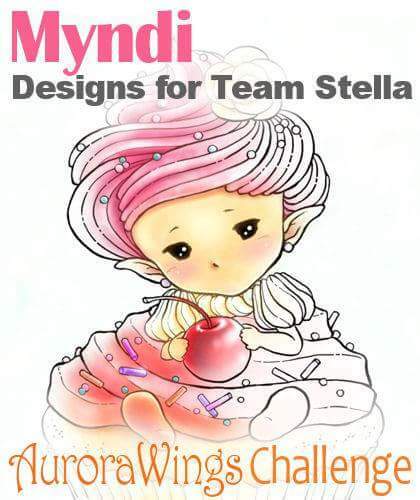 We look forward to seeing what you come up with for this challenge.